A screenshot from the video showing the altercation between Chris van Heerden and the suspect alleged to have killed him. Daniel Christoffel van Heerden was allegedly shot by a security guard following a heated argument. The boxing world and Meyerton community are in shock following news that Daniel Christoffel van Heerden from Meyerton, Gauteng, was shot, allegedly in cold blood, on Thursday following an alleged confrontation with a security guard. Update, Saturday, 21.23: Van Heerden’s son Danie contacted The Citizen and said his father’s last words had not been “Just a bullet will stop me,” as some have reported, although he was known for saying it. His son also confirmed that the incident happened on Thursday, not Tuesday, as had been widely reported. According to global boxing news site WBN, the victim was father to 13 children including former IBO welterweight champion Chris van Heerden, who is flying back to South Africa this weekend from his base in Los Angeles, US, to attend the funeral. Another of his sons is MMA fighter Danie “The Pitbull” Van Heerden. Police spokesperson Lieutenant Colonel Lungelo Dlamini confirmed to The Citizen that the suspect was arrested and is still in custody. He will appear in the Vereeniging Magistrates’ Court on Monday. Dlamini also confirmed that they believe Van Heerden was shot and killed in the seconds after the video clip ends. Details from the victim’s family on Facebook suggested the altercation took place near a scrap yard in Meyerton on Tuesday afternoon, but his family confirmed it in fact happened on Thursday. The security guard appears to have believed he was being hijacked after Van Heerden can be seen taking the keys to his vehicle and warning that he would call the police, but the details around the incident are not yet clear. 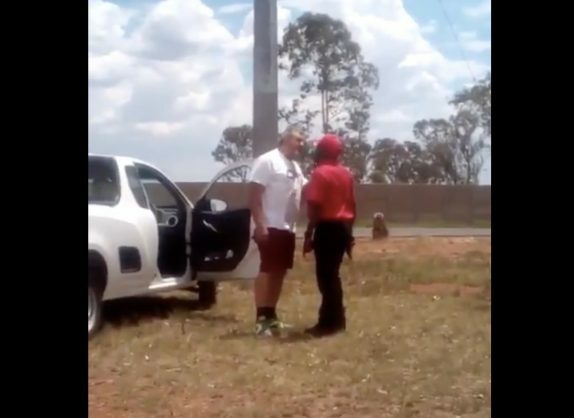 It allegedly related to Van Heerden confronting the guard about meat being offloaded from the bakkie. Chris Van Heerden has received an outpouring of support on social media after posting messages of grief and tribute to his father. The White populations are being murdered 1 by 1 and yesterday my dad was a victim of this!!! I lost my Hero ???? “R.I.P Daddy – 1957-2018. The world needs to know what is happening in South Africa. The White populations are being murdered one by one. Yesterday my dad was a victim of this! “I lost my hero. Thank you for all the love and support,” he wrote. Posting on Instagram, Danie said: “There are many kinds of dads out there. There are the gentle ones, the loving ones, the overprotective ones, and then there are the tough ones. There are many kinds of dads out there. There are the gentle ones, the loving ones, the overprotective ones, and then there are the tough ones. You know who they are. Let’s thank them, no one ever seems to want to do that.